Development and implementation of new mesh generation techniques never cease at Pointwise. The overall goals of this development almost seem contradictory: widen the software’s breadth of applicability and expand the software’s depth of capability, while also improving the overall user experience. Fortunately, Pointwise’s release cycle provides recurring opportunities to deliver something new on a regular rhythm, including maintenance releases, dot releases, and major releases. Release Candidates (RC), such as V18.0 R3C1, the first candidate of V18.0 R3, are published every three weeks to deliver up-to-date software to the limited audience of users who need specific corrections or updates - even in code that has not passed our full quality assurance testing. Usually, after four RCs, they are all rolled into a maintenance release, such as V18.0 R3, which often includes small new features, in addition to bug fixes. A dot release, such as V18.1 where we increment the number after the dot, includes large new features. Unlike RCs and maintenance releases, a dot release occurs when the features are ready (in other words, it is feature-driven, not date-driven). A major release, such as V19, includes a major new capability, usually a suite of related features. It too is feature-driven, and not date-driven. The farther one looks ahead, the harder it is to predict exactly what will be delivered. This article describes what is featured in the recent release of V18.0 R3 (a maintenance release), and what is planned for future releases: V18.1 (a dot release), and V19.0 (a major release). Despite being a maintenance release, Pointwise V18.0 R3 includes many new capabilities – some large, some small - that will help you make better meshes faster. These new and updated features touch code operation ranging from geometry model import to mesh export and many tools in between. Interoperability with your CAD software has been improved by adding support for native files from NX 11 and CATIA V5 R26. Transparency (0-100%) is now an attribute that can be applied to the display of curve and surface entities. Several of the exterior surfaces of a simplified engine block have been made transparent in Figure 1 so the internal geometry can be seen. Figure 1: The new transparency display attribute is available in the Advanced frame of the View, Attributes command. Double precision graphics is now the default instead of single precision. This will ensure that the graphical display of small mesh cells, in the boundary layer, for example, is accurate and consistent with the geometry, especially when magnified on the screen. New accelerator keys will provide easier access to certain commands. Your Customer ID, handy for logging technical support requests or license issues, can now be found in the Help, About dialog (see Figure 2), and in the Pointwise window’s title bar. The Customer ID is still displayed on start-up in the Messages window and in the File, License, Query License Status command. Figure 2: Your customer ID is displayed in the Help, About dialog and the Pointwise window's title bar (not shown). By default, the screen image zooms out when the mouse wheel is scrolled away from you and zooms in when scrolled toward you. You can now reverse that setting with a new Preference (Figure 3). Figure 3: You can change the behavior of the mouse wheel using the new Reverse Mouse Scroll preference. You can now delete all the interior control points from selected connectors using the new Delete All Interior Control Points command in the Edit toolbar. This new toolbar addition is a one-button shortcut to the 'Delete All' Interior function inside the Edit Curve command. 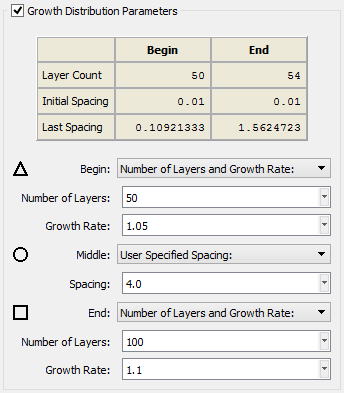 Using a new tabular display of grid point spacing in the Grid, Distribute command (Figure 4), you can now see the actual spacing value applied on a connector by the T-Rex (anisotropic tetrahedral extrusion) meshing technique with the Growth distribution function applied. Figure 4: The updated Distribute command provides much greater detail about the grid point spacing with the Growth distribution function. The icon (left side of Figure 5) that previously only served as a label for entering a connector’s dimension now opens the full Grid, Dimension command when clicked. Figure 5: Clicking on the Dimension icon now opens the full Dimension command panel. When you are using the Distribute command, setting a distribution type – for example, Growth, Geometric – will automatically open the frame containing that distribution type’s optional parameters. You can now configure Pointwise so that joined connectors do not contain internal breakpoints. By disabling Keep Break Points in the Defaults panel (Figure 6) you have two new options: keep the distribution through use of general distribution functions, or convert all distribution functions to hyperbolic tangent (TANH, the default). Figure 6: This new default setting gives you control over what happens to the distribution of grid points on connectors when they are joined. When using the Examine command to look at the Jacobian metric, the tabular display of that metric’s various categories (Figure 7) has been changed, so the cell count and percentage values are consistent. Prior to this change, rounding of the percentage value would display a 0.0 when the actual cell count was a small, but non-zero number. Figure 7: An updated table of Jacobian categories displays the percent value consistently with the count number. Histogram settings are now preserved as you change from one Examine metric function to another. For those of you who are automating your meshing with Glyph scripts, Version 18.0 R3 includes several new script tricks you will enjoy. You can now re-execute the last script you ran using Ctrl+E, even immediately after startup, because that script is now remembered from session to session. You can copy (Ctrl+Shift+C) and paste journaled Glyph script commands from the Messages window without the “Journal:” label on each line. You can now execute the pw::Database getNormal command to get the normal vector of a database surface at a given (u,v) coordinate. The pw::Database getAll command now includes a –type parameter that returns all database entities of the specified type (for example, curves, quilts, etc.). Four CAE solver formats were either updated or added so that at the end of the meshing process you can easily export your mesh and its boundary conditions to the flow solver of your choice. Keep in mind that these four exporters have been written as CAE Export Plugins, and the plugin SDK (software development kit) is available to help you write and install your own exporter. The UGRID format now includes an option to specify byte order (big or little endian). CFL3D files now include proper values for IFORCE, TWTYPE, and IUNST. The EDGE solver's format has been updated. CART3D .tri format is now a supported solver. You can now use File, Export, Grid to write FieldView Unstructured (FV-UNS) v3.0 format. Open and Close now report and help you work with Pointwise project (.pw) files from different versions of the software. First, the Open command now writes a message indicating which version of the software saved the file you just opened (see Figure 8). Figure 8: Open now reports the Pointwise version that saved the file. Second, if you open a project file from a previous version of the software, you will be advised when you Save that the new file will no longer be able to be opened in the older version of the software. This will allow you to save the new file with a new name, using Save As, so you do not overwrite the original file. We have been working for two years under contract to the U.S. Air Force on a suite of new capabilities related to overset grid assembly (OGA). That contracted effort is due to end in August 2017. When we integrate the results of the contracted development into production code, the result will be a feature set that has a much wider applicability than just OGA. Before listing those features, keep in mind that this effort is a work in progress, and what is described here might not be exactly what is released, if it is released at all. What is listed below should be considered speculative. But with that caveat out of the way, here is what you might be able to do in V18.1. You will be able to use Frameworks to give parts of your mesh their own local (x,y,z) coordinate system for ease in meshing, and then transform each framework into its proper location in 3-D space. Drawing database-constrained lines and curves will no longer be limited by the lack of a single parametric (u,v) space. Quilts consisting of multiple parametric surfaces, and shells lacking any parametric coordinates at all, will be able to be easily drawn on. The Draw Shapes command will have the ability to create volume grids (blocks) directly in addition to database entities and sources. An enclosing block in Draw Shapes will be created as an axis-aligned box around a cloud of points. 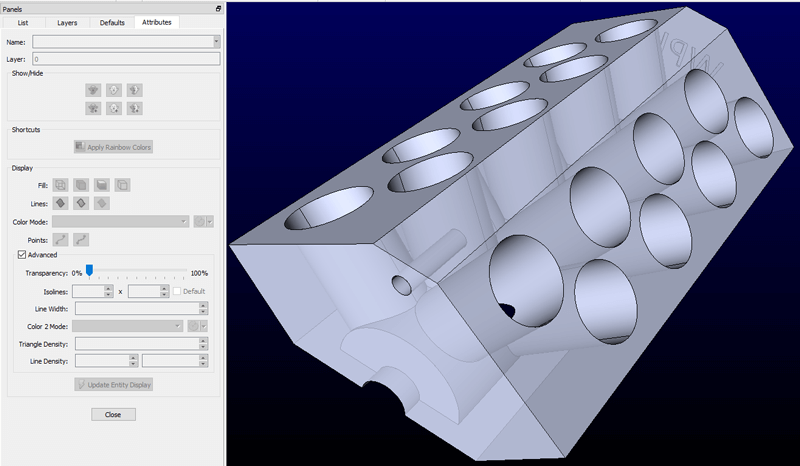 An enclosing block will be a rapid way of adding a refinement block to an overset mesh. You will be able to create a cloud of points by applying a filter to the metric functions in Examine. For example, you could create a cloud of points corresponding to all the cells downstream of X=100 with maximum included angles in excess of 170 degrees. The cuts you create in Examine that slice through the mesh and display a metric function will be able to persist outside of the Examine command. You will be able to set the location of an Examine cut by selecting a point for it to pass through. A new Grid Import Plugin will give you the ability to import meshes from any file format into Pointwise. Stay tuned for more news about Pointwise Version 18.1 as our contracted research nears completion and the conversion to production code begins. We have written quite a bit about our work on generating curved, high order meshes (“High-Order Mesh Curving Using WCN Optimization” by Steve L. Karman et al, AIAA-2016-3178). That work has begun its transition to production code. This exciting new capability will include elevation of a linear mesh’s polynomial degree, curving the surface mesh cells to conform to the geometry model, and blending that surface curvature into the volume mesh. We have been testing this new capability over the past year with some of our partners, and their feedback has been essential to shaping how the production code will look and operate. We also plan to participate in the 5th International Workshop on High-Order CFD Methods on our own, and by generating high order meshes for partners and customers.